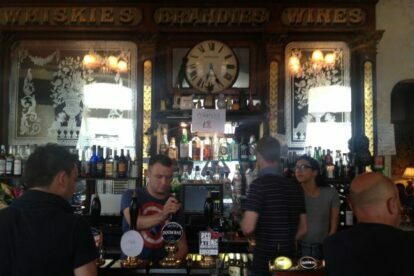 Now this is a real gem of a pub. Hiding away on a small residential street in Kentish Town stands the legend that is The Pineapple. This place was recommended to me by a friend who lives in Derbyshire…she met a pub landlord in the Midlands – a few hundred miles away – who told her that his entire establishment was modelled around a small pub in north London. That pub turned out to be The Pineapple. And luck would have it that The Pineapple just happened to be around the corner from my old flat in Tufnell Park. It has everything you want from a pub: beer, tables, toilets, food (Thai), friendly locals, board games, beer garden, etc. The thing is, it just does everything so well. The bar is a grand affair of shimmering glass mirrors, brass beer taps and marbled surfaces. The floral wallpaper, oversized lampshades, faux chandeliers and patterned sofas run the line perfectly between elegant nostalgia and tacky sentimentalism. I like to visit on Monday nights for the quiz, which is presented in a characteristically jovial manner by one of the bar staff. However, I don’t like the way that I always place near the bottom of the pile; it seems the patrons of The Pineapple are both friendly and intelligent. Another custom that’s worth a mention is ‘Cheese Thursdays’. Either bring a slab of your favourite fromage or just make a £3 contribution and tuck into a massive board of different cheeses and crackers. Enjoy!